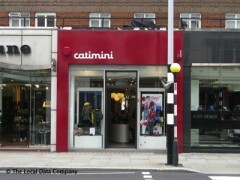 I drove up to the Kings Road yesterday afternoon (9 Dec), paid my congestion charge + parking and headed over to Catimini for a specific Christmas gift for my daughter. When I arrived at 5 30 / 5 45 the shop was locked although there was a sales associate inside. I knocked thinking there must be a mistake -- it was early and every other shop on the Kings Road was open! She mouthed, closed. I was sooo looking forward to checking another gift off my list. I feel disappointed and wonder why why why would they close early 15 days before Christmas?? ?